These little things still serve quite a lot of purposes even when the contents are already gone. Put on your thinking hat and get a little creative with tin cans for your own organizational use. With slight tweaks here and there, you can repurpose them into versatile storage. Your pie-cans are perfect for storing your cooking utensils. Bolt three striking cans into a wooden cutting board and secure them with a frame hanger on the back. Mount the board on the wall near the stove for easier access when cooking. Of course, you can opt to peel the label off and wrap the cans in a pretty floral wrapping for a more beautiful display. 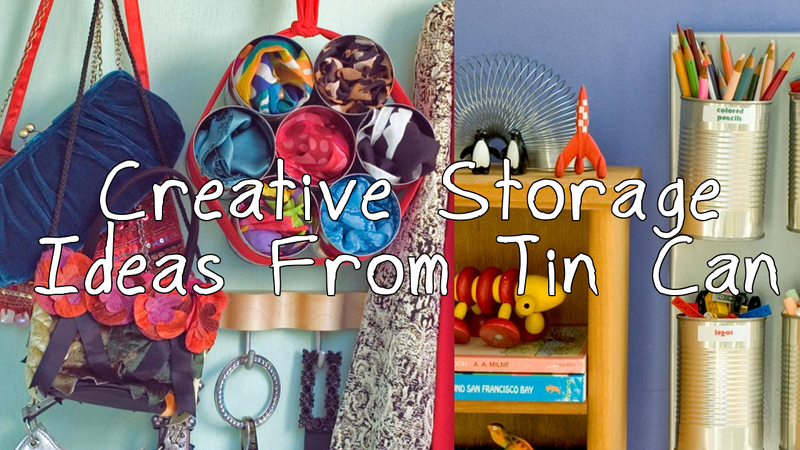 This creative storage idea from tin can will only take a half hour at most out of your schedule. Your pens, highlights and coloring pencils are scattered to the four winds? Sort them out with tin cans and make your bedroom a little more organized. Attach a heavy-duty magnet to a soup can with hot-glue and stick it to a steel cookie sheet. You can decide for yourself how many cans you will stick on the sheet but we recommend that you get 10 of them. This simple project is useful if you happen to have a kid. Hang it on your kid’s bedroom using a plate hanger and use the cans to hold crayons, chalk, pencils, or even small toys. Label each can for easy identification. Every homeowner always have one of their drawers stacked with trinkets and useless junk. It gets irritating when you have to spend a lot of time searching for your keys inside a drawer full of knick-knacks. Get every item sorted out by cleaning a dozen of tuna cans and nestling them into a drawer. Each container can be used to store rubber bands, clips, thumbtacks or knitting supplies. Who would think that cans can be great storage for something that is usually stored in a closet? By simply arranging seven sleek soup cans in a tight circle with one can on the center and wrapping a long sash around the bundle of cans, you can display your scarves inside the cups. Secure the bundle with a knot at the top, then hang it on the wall. Not only will you get a free organizer but it also adds stylish organization to your wall or closet, whenever you decide to display it! If you think hanging your towels on the back of your bathroom door makes the room seem messy or that the distance between your door and the bathtub is not convenient for you, then try this easy DIY towel storage made out of tin cans! Repurpose 6 (it can be more or less than this) tin cans by hot-gluing the bottom of the cans to heavy-duty magnets. Then attach them on a steel or iron board and mount the board into the wall near the bathtub with bolts. Wrap your cans in floral wallpaper for a cute look.